When Valve switched to random weapon drops instead of achievement-based unlocks, achievement servers became "idling servers." Players created and distributed tools to help them park themselves in static servers and passively receive random drops with as little effort as possible. Because Valve did not comment on achievement servers before, players assumed it was alright to continue the practice with the natural next step of idling. Only later did players learn of the developers' true intentions: In an update last year, Valve stripped players of any unlockable equipment they earned while idling and distributed wearable halos to players who hadn't been caught using idling software. There are still plenty of other mechanics in Valve games alone that may or may not be considered cheating based on the developers' whims. It's unclear what Valve's intentions are for things like chain ubercharges in TF2 or using the "kill" command in the console to commit suicide as a Boomer in L4D. Even rocket-jumping at one point could have been considered an exploit. And a patch isn't always enough to make the distinction clear to players. When Valve tweaked the Gold Rush map in TF2 to prevent Engineers from using their dispensers to reach an otherwise inaccessible area, players simply found another way to get there. 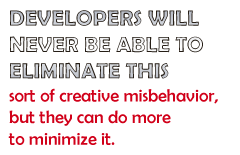 Developers will never be able to eliminate this sort of creative misbehavior, but they can do more to minimize it. For one, they can start a dialogue with players that is more substantial and ongoing than simply patches and punishments. Developers should make their stance clear to players, especially during the vital period of time between an exploit's discovery and when the developers are able to fix it. By making a public announcement about their intentions, developers can nail the problem at the source. Word will spread among players, and offenders will succumb to peer pressure or server bans. Some transparency will give players clear guidance and something to which they can direct other offending players. Combined with hints of punishment or rewards, these official statements can be very effective. They may not altogether eliminate the thin line between clever play and cheating, but at least they would make it that much more obvious when players cross it. Murray Chu is a writer living in Vancouver, British Columbia, Canada.